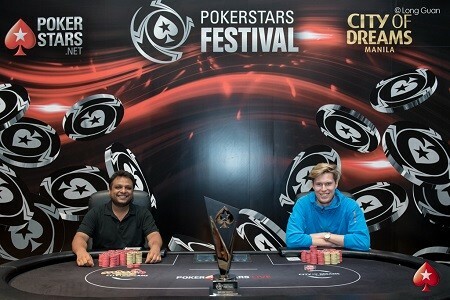 We’re almost ready to crown a champion here at PokerStars Festival Manila with a heads up battle between Antii Halme and Uday Bansal about to fire up! Currently it’s Bansal out in front with 10,190,000 but Halme still has a great shot with a very respectable 7,600,000 worth of chips to his name. Before we get to that, let’s skip to 90 minutes ago when five still remained, just prior to Jaehyun Lim losing the last of his chips. Lim’s final hand saw Mike Takayama open to 150,000 under the gun and Lim moving all in over the top for 900,000. Takayama called instantly and Lim found out he needed some help. Lim fell from six outs to four on the 7♥A♦K♣ flop but the Broadway draw would never come to fruition as the 2♥ turn and K♦ river meant Lim’s run was over. He scored PHP1,500,000 for fifth place. Fourth spot went to back-to-back final tablist Mike Takayama who finished in exactly the same place last year. It was Antii Halme who took him out after the Finn three-bet called off a big four-bet shove from Takayama. Halme’s J♥J♣ was in front against Takayama’s A♠8♥ and it stayed that way when the community cards came 6♥Q♥5♥3♦3♣. Takayama picked up PHP1,900,000 and he was sent to the rail to leave us with just three in contention. Michael Falcon had been flying high for the last two days of play but his hot streak finally came to an end just moments ago. It was chip leader Bansal who got the best of him after Bansal button-raised to 180,000. Halme and Falcon made the call from the small blind and big blind respectively and the dealer fanned a flop of 9♣4♥5♣. It was checked to Bansal who continued for 275,000, and following Halme’s call, Falcon shipped his entire 2.83 million-chip stack in. Bansal asked for a count and made the call with Q♠9♦ to see he had way the best of it when Halme folded and Falcon revealed 7♠3♦ for just a seven-high gut shot straight draw. Falcon was desperately searching for a six but he came up short as the deck ran out with the J♦ turn and 8♦ river. Falcon’s elimination brought us down to two and play will recommence shortly. Let’s find out who’s going to emerge victorious and claim PHP5,515,000 at this inaugural PokerStars Festival Manila Main Event!